Image Credits: NASA on Unsplash. The 2018 Nobel prize in economics was awarded to two US scholars who have found a way to integrate innovation and sustainability into traditional macroeconomic models. CMCC scientists whose research followed the path traced by Nordhaus and Romer explain why this prize is so important. Paul Romer, professor of economics at the Stern School of Business in New York, “has given us new tools for understanding how long-run technological change is determined in a market economy”, reads the detailed document explaining the motivation for the award conferred by the Royal Swedish Academy of Sciences. Yale economist William Nordhaus, from Yale University, “has pioneered a framework for understanding how the economy and climate of our planet are mutually dependent on each other”. 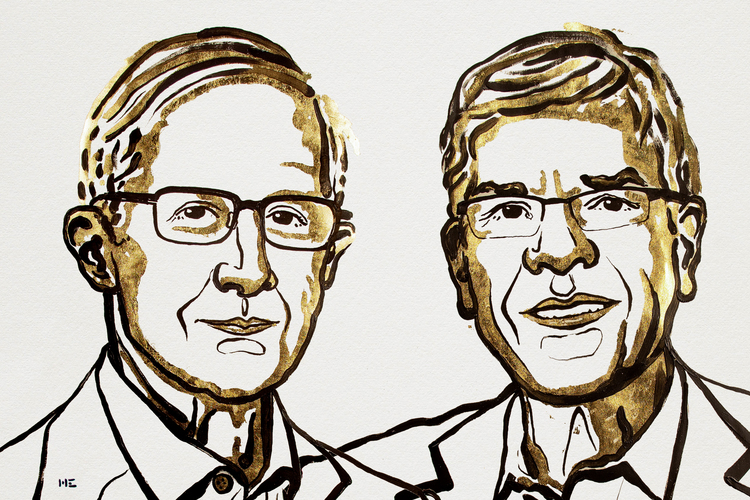 William D. Nordhaus and Paul M. Romer, 2018 Laureates in Economic Sciences. “Both have contributed significantly and disruptively in innovating previous frameworks and theories, proposing a new way of reading and interpreting reality”, explains Carlo Carraro, member of the Strategic Committee of the CMCC Foundation. “Romer has highlighted that the main drivers of economic growth include knowledge, the quality of human capital and technological innovation, thus diverging from the traditional approach in which the engines of growth are physical capital, labor, natural resources. He has foreseen the key role of knowledge, which is clearly unfolding from the 2000s onwards. Nordhaus has also included a new variable in growth models, the environmental and climatic one. His analysis has shown that growth prospects can be very different from those designed by traditional economics when we take this variable into account”. Building on from Romer’s insights and the DICE/RICE models created by Nordhaus in the early 90s, several attempts were made to grasp and develop the intuitions of the two scholars. The WITCH model is mentioned by the Nobel Committee as a “prominent example” of these efforts. Carlo Carraro, Massimo Tavoni (Director of the new European Institute on Economics and the Environment, EIEE, born from the partnership between the CMCC Foundation and the US think tank Resources for the Future), and Valentina Bosetti (senior scientist EIEE) have guided the research which led to the creation of WITCH. “Our model was the first and one of the very few able to put together the ideas proposed in the analysis of Romer – the endogenous growth generated by innovation and human capital – and in the Nordhaus’ models, thus integrating climate externalities”, Carraro explains. “WITCH was, in fact, a “spin-off” of the models developed by Nordhaus. The classic case of research that “stands on the shoulders of giants”, Tavoni comments. “The beauty of his work is that it has always been publicly available, intended to be used, criticized and modified. A great, ante litteram, experiment of science transparency”. “In addition to being a deserved recognition for two great scientists, this Nobel is an ode to the potential of macroeconomics for still being able to help tackle the current and future problems,” Bosetti comments. “Although mainstream macroeconomic science has often been criticized for being self-referential and abstract, even by Romer himself, this award is an invitation to reinterpret it and apply it to the real world”. According to Tavoni, the prize given to Nordhaus and Romer finally shows how the economy, the planet’s health, and sustainability are closely linked to each another, and can not be looked at in isolation. “A vision that is not yet fully considered in economics textbooks and mainstream economic theories”. The Nobel Prize in Economic Sciences was announced on the same day that the IPCC released the much-awaited report on “Global Warming of 1.5 ° C“, underlining the extreme urgency of acting decisively to reduce emissions and limit the impacts of climate change. “[The report] is an important reminder about the dangers we face and the things that need to be done,” said Nordhaus. “The policies are lagging very very far behind science and what needs to be done. […] We have a fair amount of progress on public awareness. Actually, the governments are lagging behind the people”.